The PTC method is similar to ERCP in that a dye is used to show up the obstruction on X-ray. 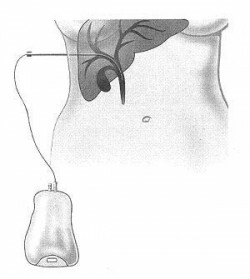 Instead of the tube being inserted through an endoscope, a needle will be inserted through the skin just below your rib cage and a fine guide-wire passed through the liver and into the blockage in the bile duct. The stent is then passed along this wire. What happens during a PTC? As with ERCP, you must not eat or drink anything for at least six hours beforehand. You will have some sedation and you will also have a local anaesthetic so you should not feel pain as the needle or wire is passed through the skin. Some people find that moving the wire into the correct position in the bile duct can be quite uncomfortable and some sedation is usually given. To prevent any infection you may be given antibiotics before and after the procedure. After your PTC you will need to lie flat in bed for six hours. It is likely you will stay in hospital for a few days afterwards until everything settles down. What happens if the stent becomes blocked? You may feel hot and cold with episodes of severe shivering – these episodes are known as “rigors”. Your bowel motions become pale.